Less than a fortnight after having enjoyed Carmen at the Aurora Opera House, I was back just up the road for the first of two performances of Astra Opera House's production of Aida. Considered as Verdi's only really grand opera, it is full of spectacle and colour, both vocal and instrumental. It is rich in subtle and not so subtle nuances as well as excellent development of character touching also upon very basic human situations. There is no doubt that the music, beautiful from beginning to end, helped bring the characters to life, underscoring each and every situation as the plot unravelled. Joseph Vella's direction of the Malta Philharmonic Orchestra was of course fundamental to the overall success of the performance. The combined Teatru Astra Opera Chorus and Coro Lirico Siciliano (trained by Maria Frendo and Francesco Costa) were in excellent form and with the many extras were also very well-directed in the crowd scenes. This was very well-managed in the very spectacular triumphal scene. 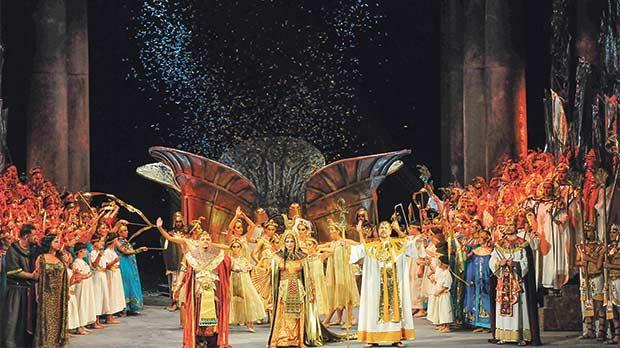 Choreography was by Sara Grech and Lucia Piquero with members of the former's School of Dance and the latter's Żfinmalta Apprentice Dancers adding to the spectacle, whether in Amneris's apartments or in the triumphal scene. I liked Enrico Stinchelli's idea to have a sort of guiding of ominous spirit in the shape of one of those dainty sepulchral figures running as a connecting thread. Staging the opera with just one interval after Act II worked well and, generally, so did Stinchelli's artistic direction. However, a certain [over]-use of projections was too intrusive. The temple scene in the first half could be said to have been truly shrouded in mystery, but, it was just too dark and far too frequent was the use of sheer screens. There were less of these projections in the second half and the brief projection of rippling waves at the beginning of the Nile scene being very evocative. Still, Verdi provides enough evocation with the music adding to which the use of light effects consolidate it all. Rather odd was another projection: of the "heretic" monotheistic Akhenaten and his Sun-disk in a work replete with sundry gods and goddesses. Stinchelli's production for the Astra did away with certain details such as not insisting on having Aida and Amonasro as dark-skinned aliens in Egypt (which, in fact, they are) making one dwell even deeper in the predicament of both. Amonasro is supposed to be no differently attired than the prisoners-of-war, his identity known only to his Ethiopians and Aida. Instead, he wore a costume part of which was a distinctive red. When the debacle occurs in Act III he is supposed to escape but here he was killed on stage. Akhenaten was hated by the priesthood and this brings to mind their leitmotif which the anti-clerical Verdi uses from beginning to end in the opera. The High Priest Ramphis, a very fine interpretation by bass Carlo Colombara was authoritative, relentlessly powerful even turning down Amneris's pleas for mercy on behalf of Radames. The other and lesser bass role was creditably carried out by Petri Lindroos. Vocally, baritone Devid Cecconi's Amonasro was a warm, rich delight enhanced by a fine stage presence. The three principals had a lot to commend them. Mezzo-soprano Sanja Anastasia is a very fine singing-actress and etched very well the character of the powerful, domineering but eventually defeated princess in unrequited love for Radames. Verdi gave her no aria to sing but a string of duets and trios in which her character is well-projected and this Anastasia did very well. A bit shrill at first she settled down well and hers is the last word as she invokes Isis to grant peace to "her" doomed Radames. The latter role was interpreted by tenor Antonino Interisano. Also a good actor he has a beautiful voice and uses it well but in Act I his approximate conclusion marred Celeste Aida. He got better as the opera progressed and ended on very good form especially in the second half of the opera. Soprano Silvia dalla Benetta in the title role is endowed with a beautiful voice and presence like her rival Amneris. She too acted her part very well especially in her confrontation with Amneris as well as with Amonasro. Also slightly shrilly at first she warmed up in Ritorna vincitor!... and, rather magnificently in Qui Radames verraa`... O patria mia, which was so utterly touching. Minor roles were performed by Georgina Stalbow (Sacerdotessa) and Frans Mangion (Messaggero). Joseph Cauchi's sets were effective and functional and Manuel Grima's, George Portelli's and Arrigo Costumi's costumes were lavish and colourful without being kitsch. The lights were by George Zammit, Nexos and Juan Vella. Original article by Albert Storace from timesofmalta.com.